NEW! Similar to our award-winning Beard Saver™, a better than beard oil alternative — the Unscented Beard Saver™ is stripped down to its bare essentials for the most sensitive skin and beards. This daily leave-in conditioner is an anti-itch beard cream that adds moisture, shine and softness, while promoting new beard growth. For the established beard, just a dab rubbed throughout the facial hair, from root to tip, will manage the most unruly facial hair. Great for both your scruff and your skin. 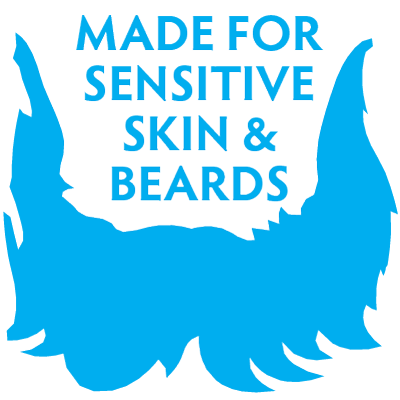 The unscented beard conditioner is made in the USA. Apply to a freshly washed face. Rub a small amount of Unscented Beard Saver™ through facial hair, from root to tip, including the skin underneath. Don't forget the neck! After all, this is the internet and everyone has something to complain about. Let me start out by saying the product is awesome and I won't go without it! I tell everyone I know with a beard that they HAVE to try this stuff and they will be hooked as well. However, it doesn't travel well as no matter how tight I put on the lid, it still leaks out when it's tumbled around in the suitcase. Keep it in a plastic bag. Unfortunately, leaving it at home is not an option as I wouldn't do without the product. I just hate to see any get spilled and wasted. Fix that issue and it would be worthy of 6 stars...it's THAT good. Great softener for a long beard. I apply it right before going to bed - not messy at all and leaves my beard softer and better behaved in the morning. I love the beard saver scented or unscented I think it does a great job conditioning my beard. It's not heavy oily or waxy its good stuff. Great product! It does have a bit of a smell, but very minor and pleasant. Helped tremendously with that new beard itch. Love it! Highly recommend it. Makes the beard nice and soft, and practically eliminated that new beard itch. Fantastic product. It came recommended by a friend and completely delivered. Every man who cares for his beard has varying needs depending on how their beard behaves (naturally lies well vs being wirey), environmental conditions (dry air & hard water), and length of their beard. These factors will influence what they need to achieve the universal objective to nurture their beard and underlying skin and have it look good. With that said, oil may be the tool of choice for some, balm for others, but this Beard Saver product is the product of choice for me and I suspect it may be preferred by many other men if they give it a try. I don't want my beard to have a lot of shine as many oils claim to impart. I want nurturing moisture without shine, I want all-day control that's not stiff, and a product that rinses out easily and has no scent. Thank you to the team at Bluebeards for crafting a simple solution that delivers exactly what it claims! Your products are unique in this crowded market segment. So far this has been the best beard product that I have ever used. The others leave your beard oily this does not. My beard is soft and itch free. It leave my beard soft and untangled and I have sensitive skin so it's tough to find something that works. You only need little bit, it lasts a long time!